If you’re a car lover, you’ve heard about clay bars. Clay bars are used to clean off pollution, contaminants, bugs, and more that are hard to clean off your car. There are several kinds of clay bars out there, but for the car connoisseurs, it’s become a little challenging to find the best bar for their budget and car. So we took up the challenge and found the best clay bars on the market for any car to make it easier for you! If you’re ready to start cleaning, it’s time to grab a bar and get going. There are several things to consider before purchasing a clay bar for your car. Depending on what kind of paint style and materials your car has, you’ll want to double check the fine print to ensure you won’t cause any damage to your vehicle. Here are a few other indicators you should look for before adding a clay bar to your cart. Bar Size: There are different bar sizes available to give you more moldability and clay to work with. 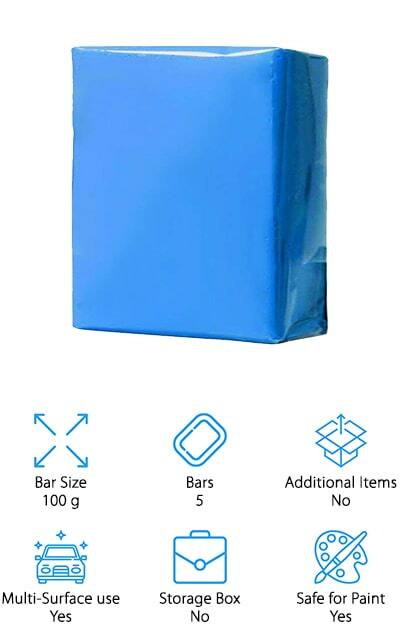 The most common bar size is 100 grams, but you will find some between 100 grams to 180 grams on our list. Bars: Most clay bars on our list only come with one bar, but there are several kits on the list that come with multiple bars that are perfect for car enthusiasts and detailing companies. If you want the best bang for your buck, look for a kit with more bars! Additional Items: Some clay bars come with additional items like sprays, towels, and storage containers. These items make it easier to store your clay bars away without them falling apart and help you clean your car, too! Multi-Surface Use: Different clay bars work on different materials. You shouldn’t expect every clay bar to be damage free for your car because only a few clay bars offer multi-surface use that allows you to clean your car’s paint, mirrors, and metal without harm! Storage Box: Storage boxes are the key to keeping your clay bars fresh. Without a storage box, you will have to find other ways to keep your clay bar out of harm’s way. If you don’t want to worry about storage, get one with a storage box! Safe for Paint: Not all clay bars are safe for all types of paint. Be sure to look at the ingredients and instructions for each clay bar to determine if you can use them on matte paint, as many are not safe for that style of paint. You now have all the information you need to know about clay bars, it’s time to make a decision. We’ve collected the best clay bars on the market to bring you our top 10 list. Our top pick and budget pick represent the two best clay bar options on our list. We’ve also added a few extra bars to our list to give you a variety to choose from. If you’re tired of going to the car wash with leftover bug juice or contaminants still on your car, it’s time to grab a clay bar! The Chemical Guys Clay Bar is known to as the “Original Gangster” clay bar that professional detailers and car enthusiasts love. This kit comes with one 100 gram clay bar and a luber synthetic spray. The bar is used to remove contamination, pollution, and overspray from your car without chipping the paint, glass, or metal. The clay has a Flex-Clay technology that allows you to bend and mold the clay to every angle of your car as you clean. Unlike other clay bars on the market, this clay comes in a unique yellow color to help eliminate even more contaminants that get stuck to your car. With an advanced formula, you can expect this clay to last longer than other products on the market, too. The luber synthetic spray is used to reduce the friction between your car and the clay bar to give you a smoother finish than other clay bars on the market. If you want the best clay bar, the Chemical Guys have it! We chose the YGDZ Automotive Clay Bar as our budget pick because it gives you two clay bars at a really great price. 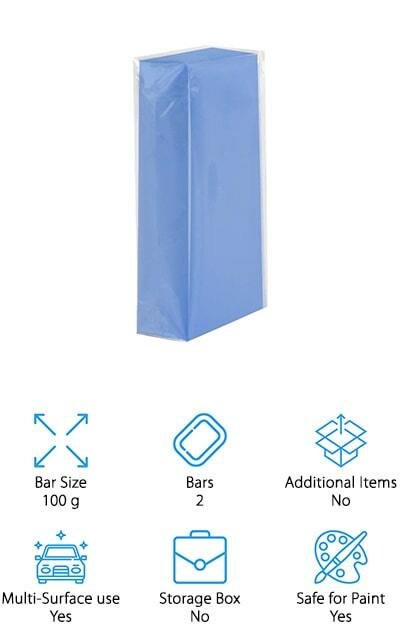 Each bar is 100 grams and is safe to use on paint, metal, and glass. You can easily remove a multitude of spots and stains with these bars including grease, dead insects, and contamination. These bars were meant to be used on almost anywhere on your car including the bumper, mirrors, grill, and more. All you need to make this clay work its magic is a little bit of water to reduce the friction between your car and the clay bar. You can easily store these bars in a Ziploc bag or other airtight container to use them over and over again, too. If you’re not satisfied with your clay bars from YGDZ, you have a one-week time frame to return these bars to get your money back or change them out. If you want the biggest bang for your buck, choose the YGDZ Automotive Clay Bar! If you’re interested in getting a complete clay bar cleaning kit, the Mothers California Gold Clay Bar Kit gives you everything you need for the perfect clean. With 2 clay bars, an instant detailing spray, and a microfiber towel, this kit delivers a high-quality clean for professional detailers and car enthusiasts. The bars are safe to use on paint and focus on cleaning up embedded metal, tree sap, pollution, overspray to give your car the fresh off the lot look each time you clean. To start your clean with this kit, spray the instant detailing spray in the area you intend to clean before you use the clay bar. After using the clay bar, use the microfiber towel to dry the area and keep other dirt and grime particles at bay. With a kit that car detailing companies love, you know you can’t go wrong with Mothers California, home of the best automotive clay bar. If you want to detail a lot of cars, the IPELY Car Clay Bar comes in a bundle of 4 bars that’s perfect for car detailing or luxury car shops. Like other clay bars, IPELY designed their bars to safely clean many surfaces on your car. From your mirrors to your paint, these bars are perfect to eliminate those hard to clean contaminants or bugs. Like other clay bars, you only need to add water to get the best clean your car has seen. These bars have a foreign particle technology that allows the clay to remove dirt and grime without sticking to the car, so you’ll never have to worry about it peeling off paint or getting stuck permanently to your car. With 4 clay bars, you need somewhere to store them when you’re not using them. That’s why the bars come in a storage box to easily keep your clay bars out of the light and free from dust. No matter what you need to clean, the IPELY Clay Bar gives your car a spotless look every time. For the female car enthusiasts out there, you’ll be smitten with Towel Motors Car Clay Bar as it was made by another woman who loves cars! This clay bar kit comes with 2 clay bars, a storage box, and a travel pouch to bring your clay bars with you on the go. 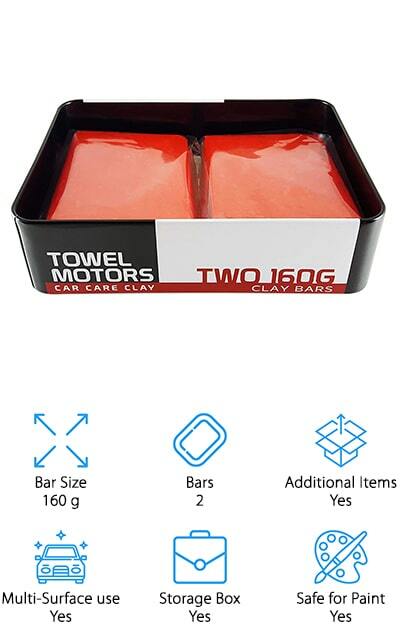 These bars are best used after you wash your car and before you polish or wax. 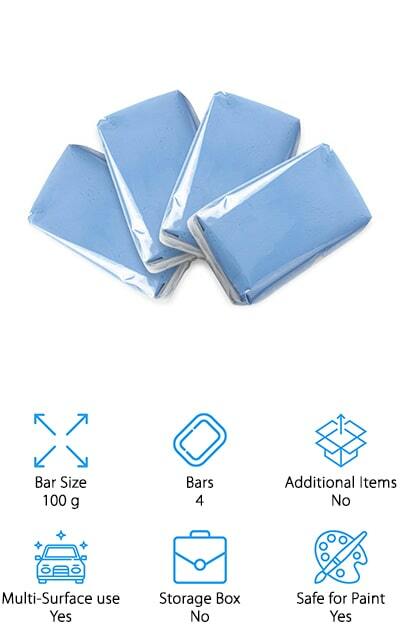 These bars allow you to safely remove hard to remove contaminants that car washes miss. You can use these clay bars to clean paint, chrome, glass, plastic, and rims without a worry of peeling or ruining your car. With 160 grams of clay in every bar, these bars are considered to be medium-grade and perfect for getting rid of stubborn blemishes. For the perfect clean every time, the Towel Motors Car Clay Bar is the best way to keep your car shiny and new. LEOBRO’s Car Clay Bar kit is great for car detailers and multi-car owners who want the best bang for their buck. 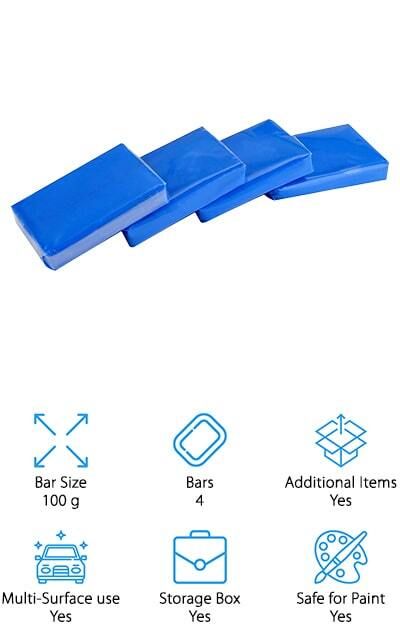 With 4 clay bars, you’ll have the perfect number of bars to clean several cars. These bars specialize in removing grease, rust, dead insects, and contamination for pollution. All you need to do is add water to your bars to get them ready to clean up any excess mess that your car wash doesn’t get. 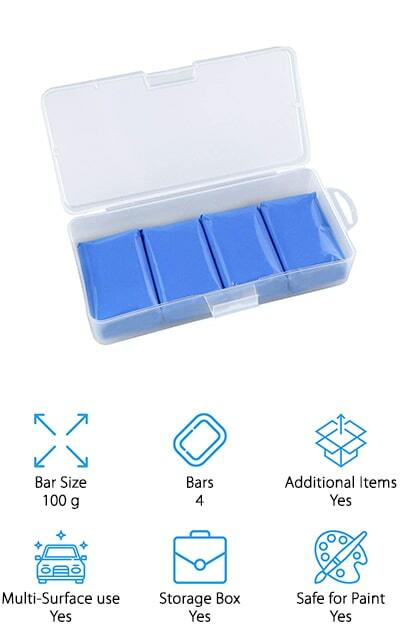 These bars do not come with a storage box or bag, so you’ll have to find a place to stow the clay away to keep it from deteriorating. You can use these bars almost anywhere on your car including the bumper, mirrors, and paint. The LEOBRO Car Clay Bar kit is clearly the best clay bar for car detailers who need a flawless clean every time. If you want a great deal on clay bars, look no further! Swpeet’s Detailing Car Clay Bar bundle comes with 5 bars to help you clean every inch of several different cars. Made with high-quality clay, these bars are highly deformable and moldable to any part of your vehicle. These bars make it easier, safer, and more efficient to clean the paint, mirrors, and other places that attract dirt and grime, too. Once you start cleaning your car with these clay bars, Swpeet encourages you to fold over the contaminated clay to continue washing away rust, grease, dead insects, and overspray. You’ll need to store these bars in a cool and dry place to avoid damaging them when you’re not cleaning your car. Swpeet’s Detailing Car Clay Bars are perfect for flawless detailing after a car wash. This bundle has the most clay bars out of all of the clay bar kits on the list, so it makes the perfect gift for a car enthusiast who has several cars in their garage. Senrokes Car Detailing Clay is one of the best kits on our list. With 4 clay bars, a storage box, and a cleaning towel, you have everything you need to clean your entire car. Just like other clay bars, this clay needs a little-added water before you get started. You’ll be able to efficiently and effectively clean almost anywhere on our vehicle including lacquer, glass, and chrome plated surfaces. The cleaning towel comes in handy to dry each area you clean to ensure you don’t miss a spot. These clay bars are not meant to be used on transparent plastic, so keep it away from those areas if your vehicle has them. 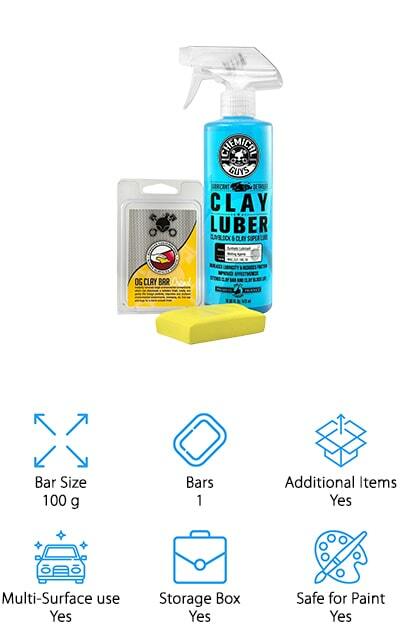 Unlike other clay bars, this clay is great for removing fine scratches and stains, too. If you want a thorough and flawless clean every time, the Senrokes Car Detailing Clay is another great option that we love and it’s car enthusiast approved! The MATCC Car Clay Bar is a lot like the Senrokes Car Detailing Clay. This bundle only comes with 2 clay bars but at a bigger bar size of 180 grams. 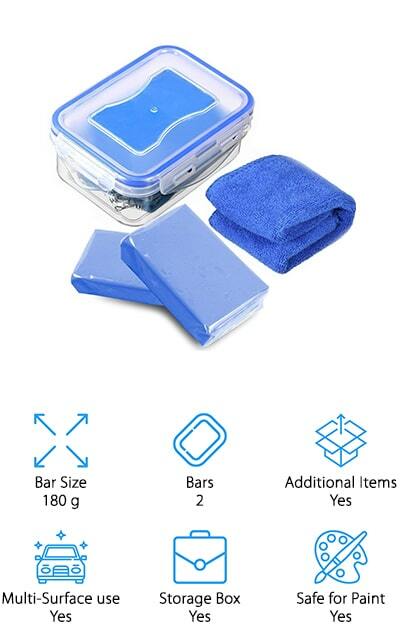 You’ll also receive a storage box and a cleaning towel to get you ready to clean as soon as possible. These bars are made of superfine fiber, sticky solid gelatin, and small stoma to give you a super flexible clay that cleanses the hard to remove stains. These bars can be molded and kneaded into almost any shape to clean in crevices and hard to reach places on your vehicle. You can easily remove overspray, iron powder, oxide layer, rust, stains, and hard water deposits. Used clay bars should be stored in water after each use to avoid drying them out. 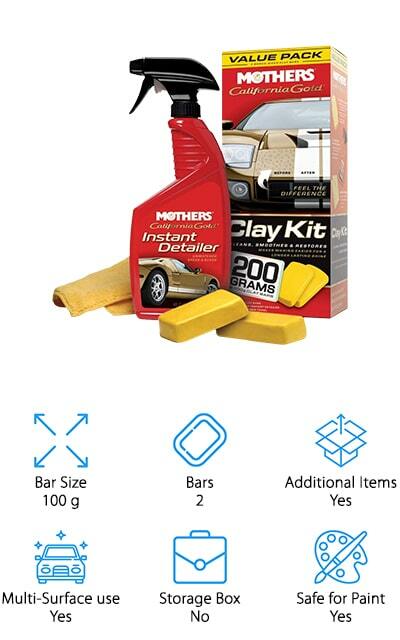 For multi-surface, multi-contaminant cleaning, the only thing you’ll need is a MATCC Car Clay Bar. Grab yourself a few clay bars and get ready for the cleanest car you’ve ever seen! Last but not least is the Fixget Car Clay Bar. 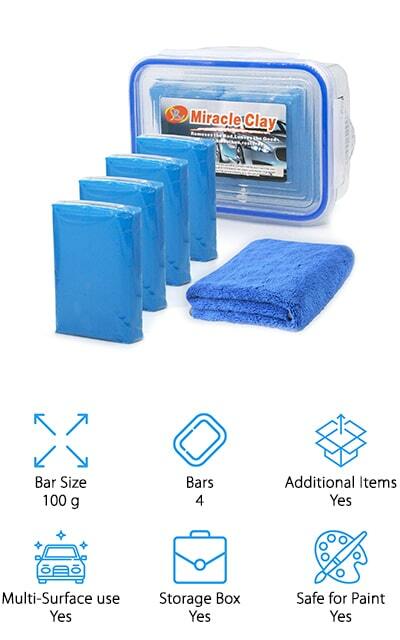 This bundle includes 4 clay bars, a storage box, and a cleaning towel to make cleaning your car as easy as it gets. You can reuse these clay bars over and over again to get the best bang for your buck. Made with stoma, you can easily knead or mold these bars to clean even in the tiniest of crevices of your car. Before your first use, be sure to soak the clay in water to make it easier to mold around your vehicle. The cleaning cloth makes it easy to see any spots you missed after cleaning with the clay bar, just wipe the liquid away and you’re done! If you find it difficult to get rid of even the smallest of contaminants off your car after a wash, the Fixget Car Clay Bar’s formula will clean stains and dead insects easier than scrubbing on our hands and knees.